Google Panda and Penguin updates ultimately aim at keeping sites with high-quality content in the rankings while penalizing sites that have spammy or poor-quality content and links. Know the difference and how they change the search engine results pages (SERPs). Panda is an algorithm update that was launched by Google in 2011, one year prior to the release of the Penguin update which built upon the Panda foundation. By 2011, it was becoming clear that some web developers and digital marketers were manipulating search engines to favor their websites over their competitors. As businesses realized the need for a web presence, the number of websites began to skyrocket which subsequently made it more difficult to rank higher in Google’s search engine results pages (SERPs). Back in the early days of search engines, a web presence alone, depending on the type of business, was sometimes enough to score high on Google’s search engine ranking. But a lot has changed since and many web developers and SEO's found black-hatted ways to gain a competitive edge over the rivals. That edge, however, was derived at the expense of average internet users as they were often overwhelmed with spammy and useless search results full of websites that existed for the sole purpose of increasing search engine ranks and driving traffic to a particular website. Google, being the search engine and web innovators that it is, took notice of this growing problem. They knew an update in their algorithm was necessary to clean up their SERPs. Google wanted to rank sites higher in results because they are worthy to provide to users, not because they knew how to manipulate the system. And this conundrum birthed the Penguin and Panda updates. Updates that would reward websites based on how substantial and informative their content was. What are the Differences in the Panda & the Penguin Updates? To understand how impactful Penguin was to the search engine optimization companies, we must first trace the roots back a year earlier to the Panda update of February 2011. 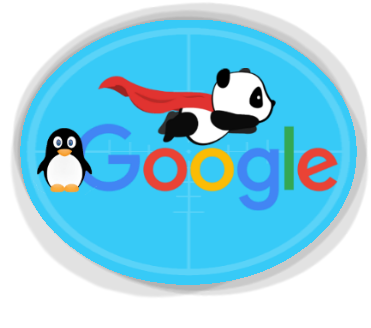 The main goal of Panda was to improve Google’s search engine rankings by developing an algorithm update that would detect a quality content-enriched site over a spammy site that was created for the sole purpose of creating backlinks and keywords to a company website. Ultimately black-hat SEO. The Panda update also aimed to focus on quality content and rewarded websites that had quality content. As a result, rankings were altered based on the quality of content within a site. The Panda update also sought out to eliminate sites with thinned out and duplicate content. Spammy sites were demoted to the point where they were no longer found by the internet users. The biggest victims of the Panda algorithm update were content creation sites. In the days prior to Panda, many content creation sites took information from reliable sources and repurposed the content on their own sites for the sole purpose of generating traffic and ranking well in Google. Initially, many industry experts thought that the Panda update was targeted at websites that existed primarily for the purpose of stuffing it with backlinks to their website. However, unlike the Penguin update which was designed to address this issue, the Panda update focused on weeding out poor content. So as long as your link stuffed website had quality content, it was fine with Google. Of course, with SEO experts knowing this small, but important fact, the keyword bloat and back stuffing of links continued to happen. So, with the Panda update, the focus was on quality content, not just filler. How do Penguin & Panda Updates Effect my site? The Penguin update, a little more than a year later decided to tackle a different SEO manipulation issue: Keyword and link stuffing. Developers and SEO strategists created sites that would link back to their client’s domain. Or they would get as many links to point to the client sites regardless of relevance and quality. In most cases, they could care less what was on these sites said as long as a link existed. And for a while, that method worked. A website’s rank was boosted by the number of links that other websites provided to your site. It wasn’t about the quality of the link, but rather the amount. The Penguin update then identified these keyword and link stuffing websites and penalized them. It devalued the links and thus lowered the site’s search engine rankings. This, combined with the quality content requirement of the Panda update, forced those SEO's to completely rethink how they will optimize for Google’s algorithm updates without compromising the current rankings. So while Panda and Penguin were essentially two separate algorithm changes, they both took aim at the same issues. Google wanted to clean up their results by providing users with relevant, thoughtful content that will actually be of use to their customers. Search engines were not about driving traffic to just any website, that wasn’t their job. Search engines, like Google, want to provide results that addressed user queries specifically. Web developers and SEO's now had to re-strategize. In order to succeed in the post Panda/Penguin world, web developers and digital marketers need to keep in mind that quality content is important. Links are still an important factor too as long as are relevant and from another quality website that can provide the user with information they can potentially benefit from. What do I Need to know about Panda & Penguin Updates? When developing content strategy for your website, remember that everything counts. Google looks at a website as a whole in order to determine if it is worth showing users when they type in a relevant search query. Google is trying to take aim at thin and poor or spammy content-rich sites. Avoid having pages that add little to zero value to your target audience. Evaluate your site by running a professional SEO audit to determine where it may need attention. This will address duplicate content as well which will impact your rankings negatively. When there’s duplicate content, Google will treat it as filler and deem your site as spam. Duplicate content can be content that you have copied and repeated within the confines of your own site or content that has been flagged as duplicate content from other sites. Keeping content fresh, relevant, engaging, informative and most of all, unique is key to a successful digital marketing strategy. An expert in online marketing strategies is the most efficient way to accomplish successful online marketing goals. It’s a competitive online business world and takes a team of full-time over-achievers to win in SEO.